If Lcontentdelivery.info and its subdomains (p1.lcontentdelivery.info, p2.lcontentdelivery.info, etc.) open on your browser from time to time trying to trick you into clicking “Allow” button in the notifications request and enable the site to send you notifications, most likely you have adware on your computer. Most of the times adware gets downloaded together with programs offered by free downloading sites. 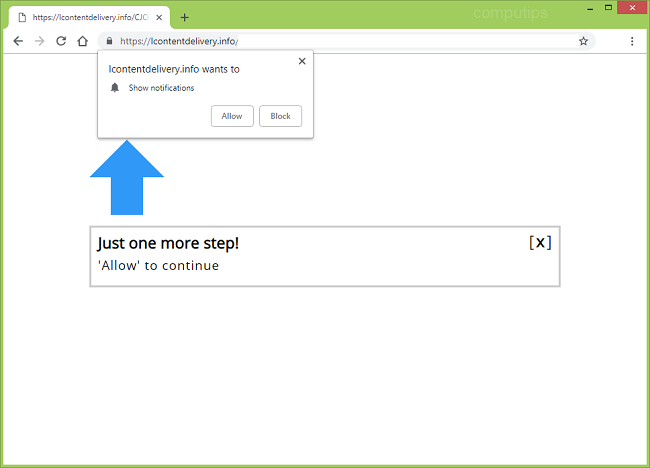 Lcontentdelivery.info notifications, if you allow them, will start popping up in the lower right corner of your window prompting you to visit various untrustworthy sites or download software. You may follow instructions below to uninstall the adware and stop Lcontentdelivery.info pop-ups and notifications. The easiest method to stop Lcontentdelivery.info ads is to run an anti-malware program capable of detecting adware in general and Lcontentdelivery.info in particular. You may try SpyHunter by Enigma Software; it has excellent detection rate when it comes to adware and other PUPs (potentially unwanted programs). You can also try to remove Lcontentdelivery.info by hand using the following instructions. Go to Programs and Features, uninstall suspicious programs, programs you don’t remember installing, or programs you installed just before Lcontentdelivery.info appeared on your browser for the first time. When you are not sure if a program is safe, look for the answer on the Internet.